Kitchen is indeed the heart of a home and when you plan to remodel it, there’s a simple thing to understand and it’s that awesome cabinets can transform a boring outdated kitchen into a great-looking place where everyone in the family and guests can gather and have a good time. It has now become super easy to have great kitchen cabinetry because they come in such a vast array of patterns, features and prices. 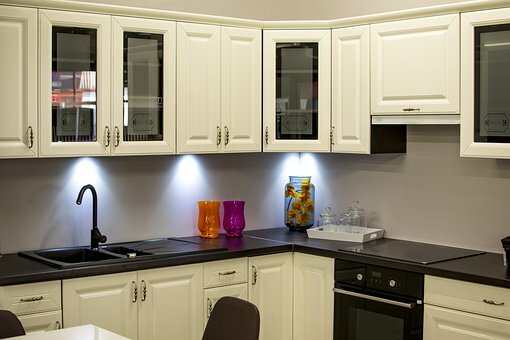 Here are some amazing tips for revamping your kitchen cabinets. First of all, check for high quality because your kitchen cabinets must survive normal abuse for years to come. They will go through huge temperature changes from 5° F to 120° F and will have to suffer dousing of lemon, vinegar, ketchups, coffee and fruit juices without having signs of discoloration, blistering and other types of damage. The 1st two are the most popular, especially the stock cabinets, because of their low price, instant availability and wide range of accessory options like full-extension glides and furniture fleet. Semi-custom cabinets too come in a wide range of styles, finishes and sizes. Custom cabinets are the priciest and can take even up to 12 weeks to manufacture. When you shop for kitchen cabinets don’t forget to look through the available options because there are so many of them. For example, they have full extension roll-out shelves that don’t need you to abrade your knuckles while reaching items buried deep inside. Base cabinets come with large drawers that can hold pans, pots and dry goods. So also, you can get built-in open-storage systems such as china or wine racks that look fantastic even if they are empty. 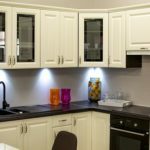 When it comes to choosing materials for your kitchen cabinetry, you can have light-colored woods like maple and oak if you want your kitchen look larger and brighter. On the other hand, darker woods like mahogany and cherry can offer a striking, furniture-like effect. Be keen about having strong boxes of the cabinets, i.e. with at least ½-inch thick walls that can be secured to the wall studs with screws. Material of the box can include oriented strand board (OSB) and medium-density fiberboard (MDF). Or you can have plywood with mortise or dado joints and wood or metal corner braces for rigidity. Last but not the least, have a repair kit at hand which should include extra hinges, drawer-slide systems, putty, coloured wax or markers etc. Remember these points during your kitchen revamp project and enjoy an organised, functional and beautiful kitchen.